Isn’t it amazing what a little courage can do? Most people are simply just surviving, or trying to do so. Indeed, something that I’ve come to learn over the course of this happiness project is that I have to remain in the present. And the great thing about a blog like this is that it provides me with the luxury of reflection. It’s a familiar medium through which I can articulate my thoughts, emotions, and experiences. It’s a way for me to share the lessons that I’ve committed to memory with those who may be experiencing something similar. What I write is real. How can I reflect upon my experiences if I’m not honest? On March 2nd 2012, I made one of the most important and difficult decisions of my life. On March 16th 2012, I started a project that has changed my life in ways I could have never imagined. Although I’ve made changes to my lifestyle, what has become most important is learning to let go. Be it relationships, conflict, loss, or failure, we have to trust ourselves and let go. We all dwell on the past. I certainly do that a lot. Self doubt? For someone with an anxiety disorder like myself, that plays a very antagonistic role on a day-to-day basis. The thing is, and it’s taken a while to realize it, we have to trust that we can meet the standards we set for ourselves. We have to stop in our tracks when we feel doubtful and simply say, “I am capable”. Indeed, some may think that it is silly that I started putting my bucket list into print. There is actually a document on my desktop titled “100 THINGS I WANT TO DO BEFORE I DIE”. To all who may ridicule this, have you ever had dreams? Have you ever given up? By making a list, I’m reaffirming that I believe, no matter how deep within our consciousness, in my capabilities. I trust that I can complete the dreams I put into print. Self-esteem builders like this are great. Sure we may not achieve some. Heck, we may even fail. But the act of completing at least one demonstrates that we are capable of great things. We are capable of succeeding at things that at a glance may seem outlandish. On March 2nd 2012, I made one of the most important and difficult decisions of my life (so far). On March 16th 2012, I started a project that has changed my life in ways I could have never imagined. It’s April 29, 2012 and I can’t wait to see what the future has in store for me. Isn’t it amazing the impact the smallest bit of courage has on the course of your life? Cycling. 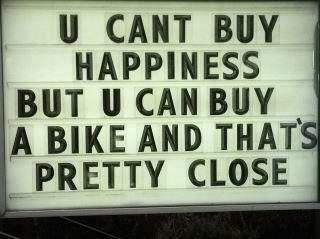 Pretty close to happiness? I should dust off my bike, buy a new helmet, and go for a ride. Isn’t it strange how everything comes together? Stacy Clark. Fantastic musician. Moving lyrics. I remember watching episodes of The Buried Life with my brother when they first aired in 2010. I remember being incredibly moved. At the time, I was a member of the Jane Goodall Canadian Youth Leadership Council and was teaching kids at a local school about wildlife conservation and sustainable living. The project culminated in the students being invited to a youth event the Royal Ontario Museum. Sharing my knowledge with the students and their teacher, and providing them with the opportunity to experience what I’m passionate about was easily one of the best experiences of my life. The feeling was indescribable. The experience, both the project and working on the council, changed my life and I hope I was able to do the same for the people I encountered along the way. This being said, the folks of The Buried Life showed me that it’s never too late to realize that anyone can do anything. Anything is possible. Duncan Penn, Jonnie Penn, Ben Nemtin, and Dave Lingwood (The Buried Life)…thank you. Inspiration: Where can I get some? For years, I’ve always kept a notebook. It’s a habit I picked up from a friend of mine when I got my first job at the museum. They’ve always served as a way for me to express myself when spoken word failed, organize my thoughts, and keep a constant source of inspiration at my side. Everyone has a few motivational quotes that help them out of rough times. When all is going wrong, when we feel that our dreams are too far away to accomplish, and in the depths of despair, something always pulls us out. I know all too well the power of inspirational words. Over the years, I’ve taken and discarded numerous words of wisdom. People change. And so do the things that inspire us. Attached is a selection of quotes that have made continuing this happiness project possible. Yesterday afternoon, on the way to the lab where I’m conducting my research, I read an interesting article in the newspaper about “What Do You Want to Do Before You Die?”, the first book written by the guys behind The Buried Life (Jonnie Penn, Dave Lingwood, Duncan Penn and Ben Nemtin). I remember watching their documentary project-turned TV series when it first came out and being absolutely blown away. Long before I even started this Happiness Project and began re-evaluating my life, their show got me thinking. What do I want to do before I die? I started a list. I’ve written 25 things and I’m aiming for 100. Once I’ve completed my list, I will post it. Don’t expect it soon though, this isn’t the type of thing to rush. I went out for lunch with a good friend of mine. Life’s too short, we were craving street food, and were pressed for time. Hot dogs were a simple and delicious solution. As you may know from a previous post, I like to eat my hot dog with a melody of sauces and toppings. A question that arose during our lunch, one that I want to ask you, is “do toppings ruin a basic hot dog?”. we are the lovesick. the fearless ones. the never giving up. moments in the sea of time. we are the lost ones wandering. the sun we will always rise. hope still shining in our eyes..
Video games? What about the magical power of imagination? For those of you who don’t know me, I’m a pretty big gamer. It’s a big part of who I am. My first video game console was an N64. I got a late start with video games because my parents didn’t believe in them. Since then, I’ve expanded my gaming repertoire to (and in no particular order) PC games, Gamecube, Gameboy Colour, Xbox 360, PSP, Nintendo DS, Mac, and PS3. Gaming is a huge part of my life. An escape. A sure-fire way to put a smile on my face at the end of a long and stressful day. In times of trouble, I know that I could decompress and re-motivate myself in a constructive manner at the press of a button. But none of the games that I’ve played have had as significant of an impact on my life as Dungeons and Dragons.